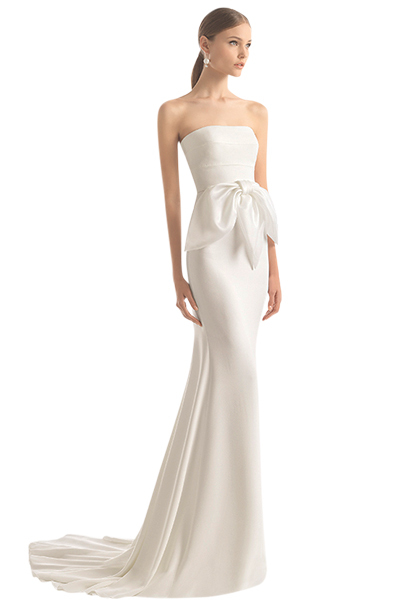 Tie the knot in a sleek frock paired with warm hues and rosy tones. Gown by Oscar de la Renta. 18k gold bow necklace by Tiffany & Co.
Chandelier earrings by Capwell + Co.
Peep-toe pump with back bow by Nina. Pearl and crystal clutch by Aldo. Cityscape foil-pressed invite by Mansi for Minted. Rose gold lingerie set by Parfait. Blush and rose gold cake by Heidi Moore Holmon for De La Crème Creative Studio. Photo Credit: Heidi Moore Holmon for De La Crème Creative Studio.